In only a week and a half one of the biggest cooking days of the year is upon us!!! I’ve been talking about it for months now. MONTHS. And I’ve been testing Thanksgiving recipes using Knorr Homestyle Stocks the whole time. Yet as one would expect for a procrastinator like myself, I haven’t sat down to plan my actual Thanksgiving meal. With a last second change of plans I am no longer going to be spending Turkey Day in Puerto Rico, but will be in the deep south where I’ve offered to cook the whole meal myself (though I’m sure I’ll have assistants)! To get in the mood to even think about planning a whole meal I decided to make myself a entire Thanksgiving-themed dinner rather than just a side dish like I’ve been doing. I made this herb roasted turkey breast – a timeless classic where you rub the herbs and seasoning under the skin. Seriously once you taste this turkey breast you’ll throw out your old recipe or stop doing the whole bird altogether. (Though if that’s not an option, here is an entire turkey guide that can give you reference to all of the ins and outs of the roasting process from defrosting to resting. Or if you are feeling nontraditional – I can also suggest this chipotle-brined butterflied grilled turkey which was off the chiz-ain, yo!) 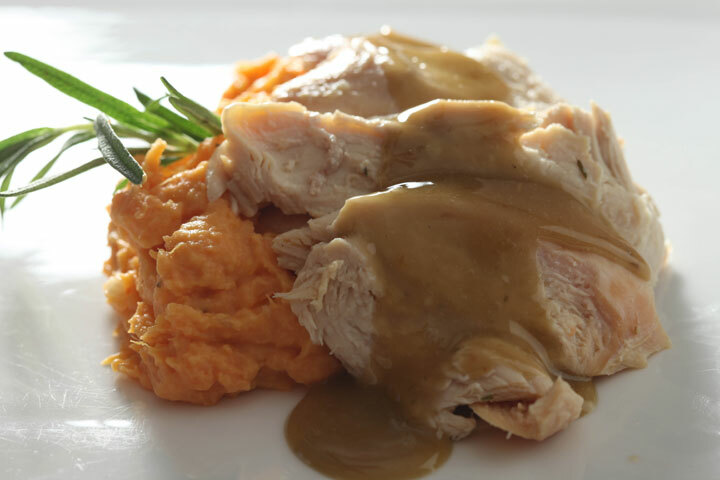 😉 Anyway, in addition to turkey breast, I decided to whip up some some cream cheese and garlic mash sweet potatoes spiked with some Knorr Homestyle Chicken Stock and dash of cinnamon and nutmeg. I finished off the plate with a Champagne-Rosemary Beurre Blanc. (Which may or may not have been an excuse to buy a bottle of champagne so I could drink the leftovers.) Regardless – this plate definitely screamed Thanksgiving at me and gave me some insight into what I could do next week. Now whether I actually stick with that insight or not is another story. Place all ingredients except the butter into a sauce pan over medium high heat. Bring to a boil and reduce until only a 1/4 cup of liquid remains. Strain. The base can be made up to 24 hours in advance. Store in the refrigerator until ready to continue. If working from a refrigerated base, reheat base over medium low heat until hot. If continuing straight through the recipe, return strained base to the pan and reduce the heat to medium low. Add one piece of butter to the pan, stirring continuously until the butter has been completely incorporated. Continue this process of adding one piece of butter at a time until all butter has been incorporated into an emulsified sauce. Taste and adjust seasoning as desired with kosher salt and freshly cracked black pepper. Serve immediately. This sounds perfect! I like my sweet potatoes on the not-so-sweet side so I like that they’re cut with the cream cheese and stock. And I’m pretty sure I’d be eating the champagne beurre blanc by the spoonful. Glad to hear you’re coming back to the states but what in the world is wrong with you committing to cooking an entire Thanksgiving dinner??? LOL Nicole – I was in a giving (and Thanksful) mood when I had the phone conversation! 😉 But you know I get off on that sort of thing anyway. It’ll be fun! ?… And I’m SO with you on the sweet potatoes! They are sweet enough as they are. Why do we have to add loads of sugar or syrup to them? Dude – they always seem more like a dessert than a side dish to me! I’m definitely not a sweet sweet potato person. Marshmallows? Never! Love the addition of cream cheese here. But, you have me curious about what they would be like taking them in another direction. I would like to try them- they DO look good :-)Thanks for giving me a new recipe to try! Cream cheese and sweet potatoes is so genius! I can see how these two ingredients should be together. Now I’m thinking of sweet potato cheesecake! Can it be done? Should it be done?! The cream cheese mashed sweet potato looks so delicious. I want to try to make it.